We just made a super delicious Sunday lunch. Pretty fancy, but it wasn’t much work. This would make a great meal for dinner guests. 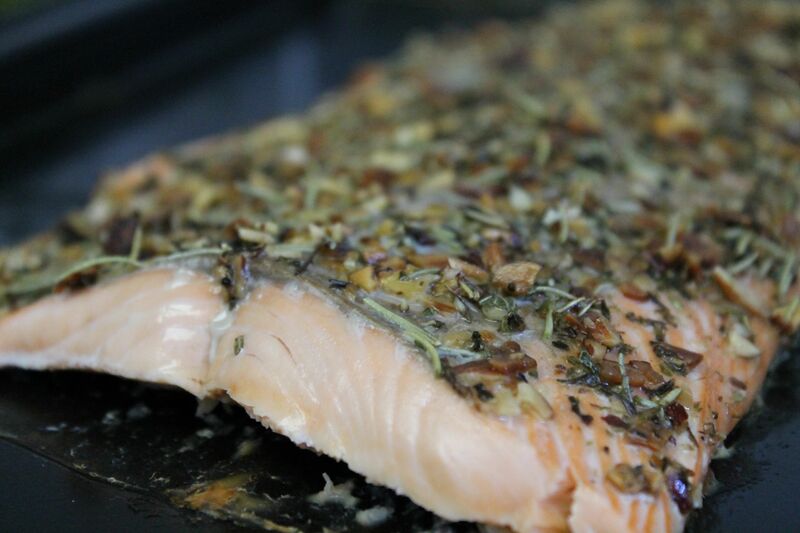 We got a frozen salmon fillet from Trader Joe’s and thawed it out. The BF laid it on a baking sheet while I put together the herb blend. I was going for a similar idea as the Herb-Crusted Pork I posted a while back. In a small bowl, I mixed up some toasted chopped almonds, dried rosemary, dried thyme, and some sage. (Sorry I don’t have exact measurements here, I was just making it up as I went.) I added enough olive oil to give it a somewhat paste-like consistency. Then I spread it evenly on top of the fish. If it looks like it’s not enough, just make a little more. I set the whole pan in the fridge until we were ready for lunch. Then the BF popped it in the oven, and we baked it on 400 F for about 12-15 minutes. He covered it in foil while it baked so it would stay moist. If you like it flakier, you may opt to go without the foil, or to take the foil off in the last few minutes. 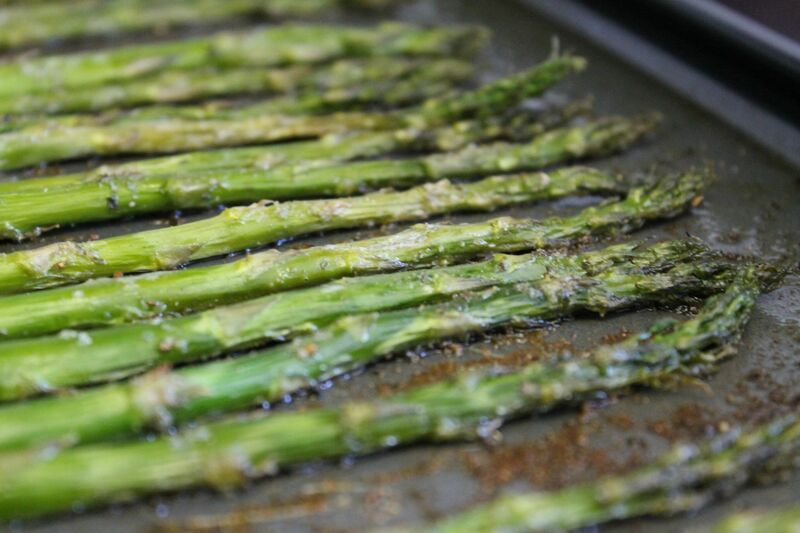 He also prepared a tray of asparagus seasoned with a lemon and garlic spice blend, and baked it right alongside the fish. That’s what made it so easy – they baked at the same temperature for the same amount of time, so only one thing to keep track of. 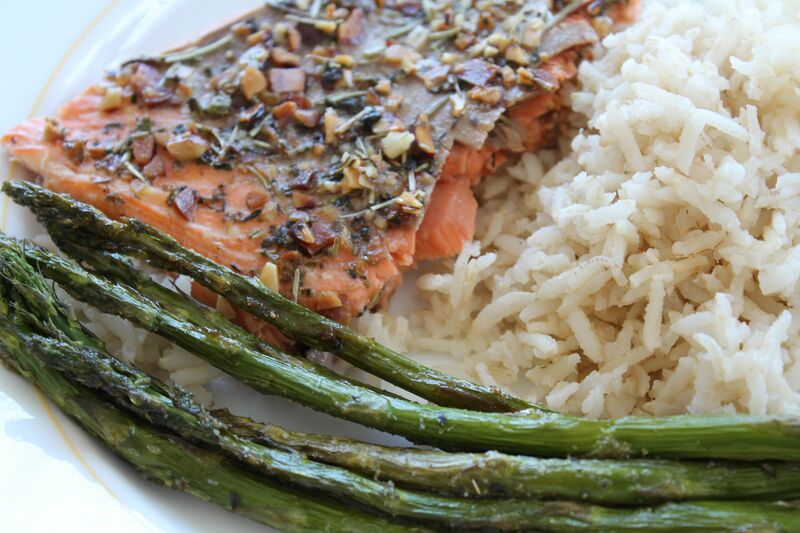 We served our fish and asparagus with brown rice. A delicious and healthy meal. Lunch is served!